Attempted to make a Vegan 7 Layer Dip this weekend (will share that later), and in the process tested out a great recipe for homemade Pico de Gallo. It’s incredibly easy to make, DELICIOUS, and yields a decent amount. Although, it’s so good, not sure how it could last more than 24 hours! I made this the night before I served it, and it created a fair amount of liquid in the container. Next time, when putting into a serving bowl, I would use a slotted spoon, so it’s not so watery. Use the seeds from the jalapeno if you want to make it spicier. Truth be told, I started with 2 tomatoes, and mixed in with the onion and cilantro. I added more tomatoes, until it looked like there was an even tomato to onion ratio. That’s the goal. Place the first four ingredients in a medium mixing bowl, stir together. Squeeze juice of one lime on top. Stir again. Add a pinch or two of salt, to taste. Will last up to 24 hours in fridge. Heat a 8-inch nonstick pan on medium-low heat. In a mixing bowl, combine first four ingredients and whisk together. Set aside. Melt the 1/4 tsp. butter in pan and spread around base and side of pan with silicone spatula. Pour egg mixture into pan and let cook until edges begin to brown and egg mixture begins to solidify enough to be able to flip on other side. Flip over and cook another few minutes. Slide pancake onto a dinner plate. Pour a little syrup and a few shakes of sprinkles. Enjoy! We found the cutest little corn “slider” tortillas yesterday at our local market and made for quite the fun dinner last night. While we were putting all the ingredients together for our mini black-bean tacos, Scott was curious how the Daiya (vegan) cheese we picked up would taste in a quesadilla. A few minutes later, we had a delicious snack! We shared one, cut into 8 triangles and topped it off with a dab of Whole Foods Cocina Mild salsa on each piece. Vegan or not, this is an easy recipe, and would make a great appetizer the next time you have friends over – or even for a late night snack on New Year’s Eve. Heat a nonstick pan or griddle. Place the tortillas on pan to heat for about a minute. Add the cheese to the tortilla on the left, spread to make an even layer. Place tortilla on right, on top, and let heat through for about 2-3 minutes. Check if melted, and if so, flip to other side, for about 30 seconds. Take off the heat, and cut into 8 triangles. Place 1/2 tsp. 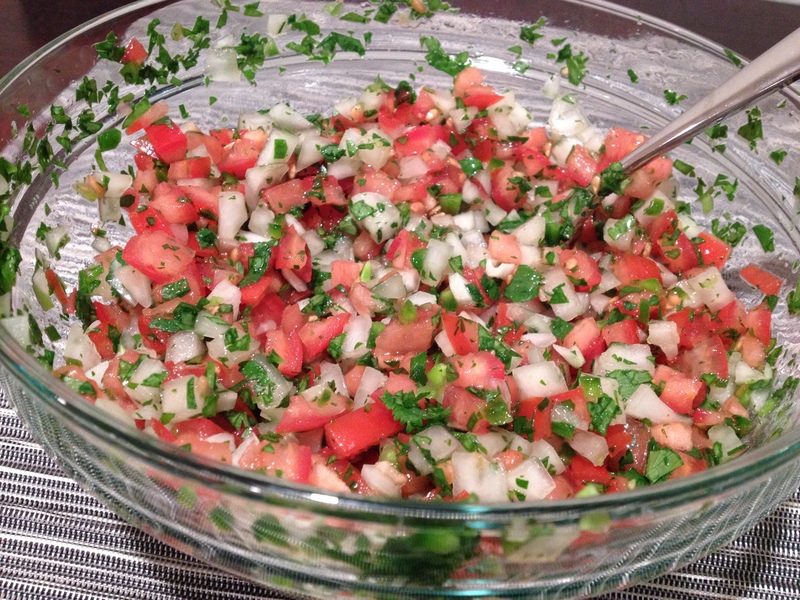 of salsa on each triangle and serve warm. An early memory I have of Thanksgiving is my Grandpa teaching me how to dress our Thanksgiving turkey. If you knew my Grandpa, you know this involves no stuffing (or “dressing”). 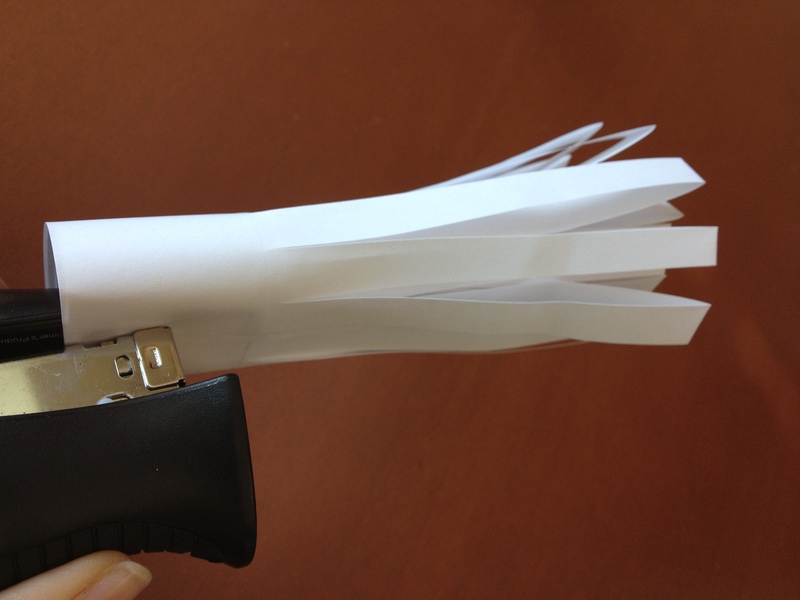 Instead, it uses four, maybe five things – 2 pieces of paper, 1 pair of scissors, a stapler, and a pen. 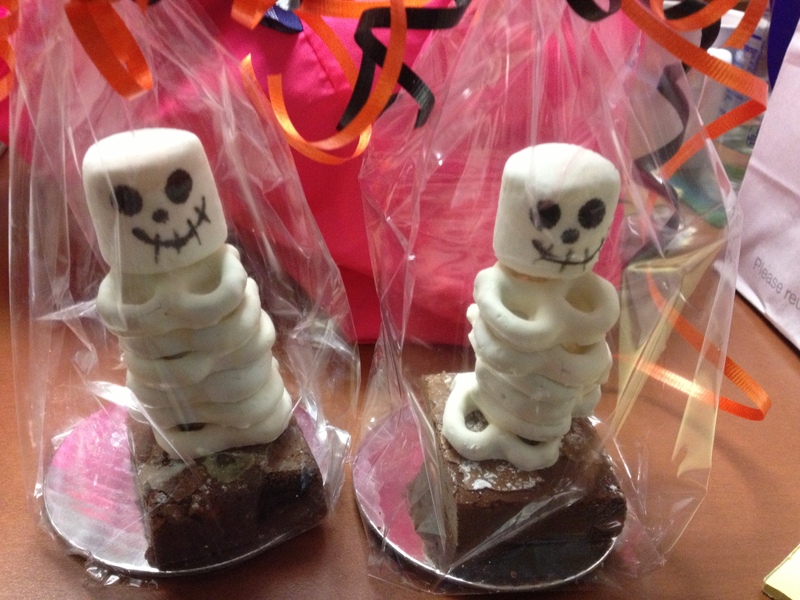 Check out the pictures below to see how you can do this at home (with or without kids!). 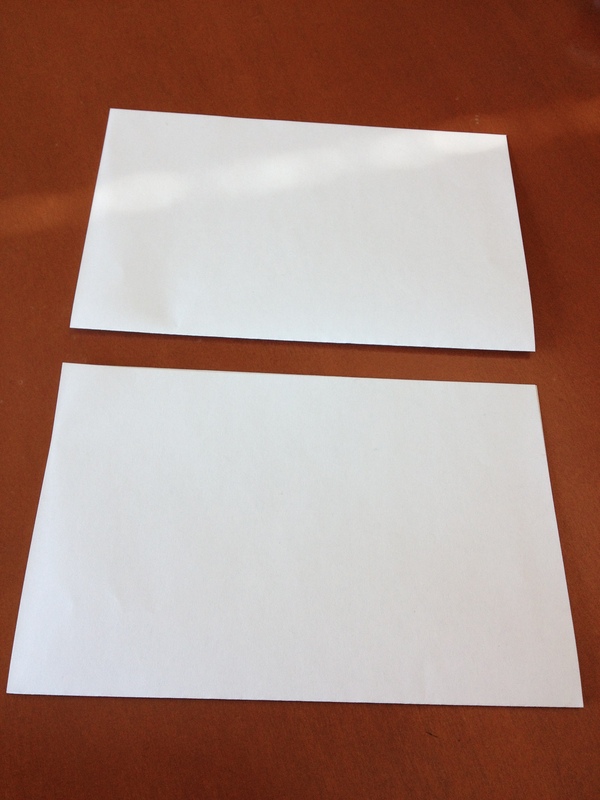 Step 1 – Take two pieces of 8.5×11 paper and fold in half. 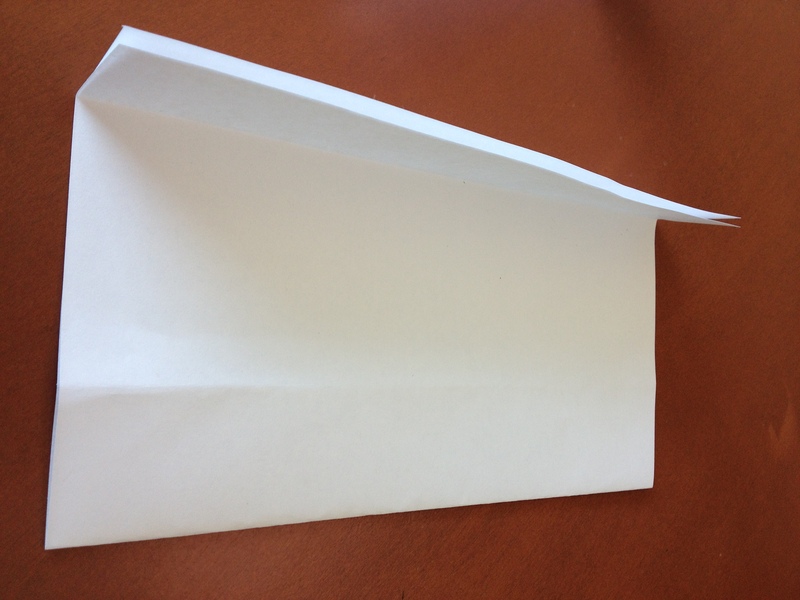 Step 2 – Fold the non-creased long edge about a 1/4 way in. 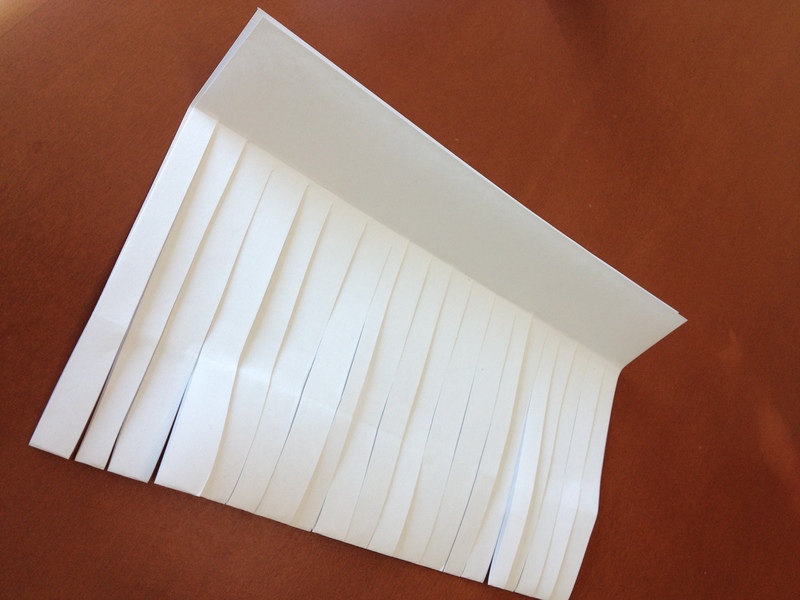 Step 3 – Starting at the folded edge, make (roughly)1/4 inch cuts to the crease you made in Step 2. 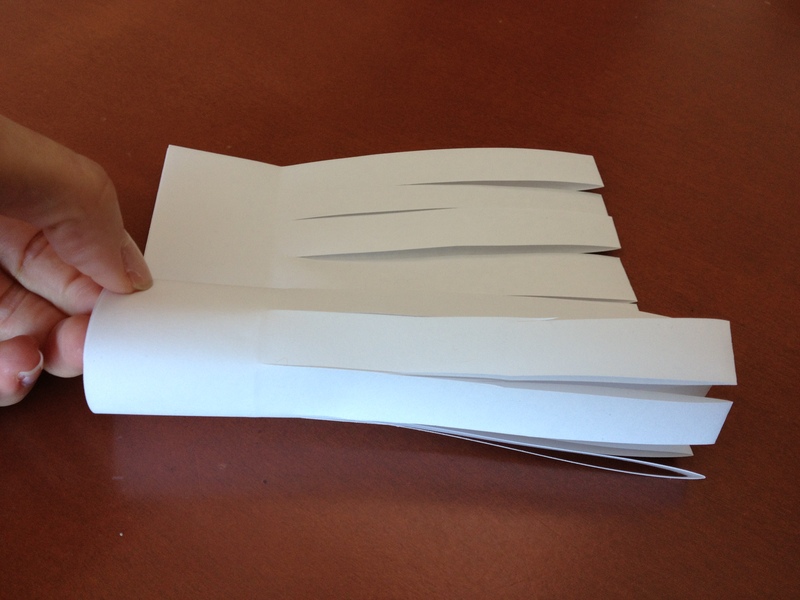 Step 4 – Roll the cut paper to a little larger than a quarter diameter, and hold in place with your fingers. Step 5 – Staple once, at seam, to hold in place. Step 6 – Place on turkey legs, right before Turkey is ready to be served. When it comes to testing out new recipes, I’m a bit of a research fiend. We’re hosting Thanksgiving Brunch later this week, meaning my research for recipes commenced about two months ago. We’ve got a great menu planned, and the stuffing is particularly special. I searched through countless recipes, videos and DVR’ed Food Network episodes, until I found the winner from the Barefoot Contessa. 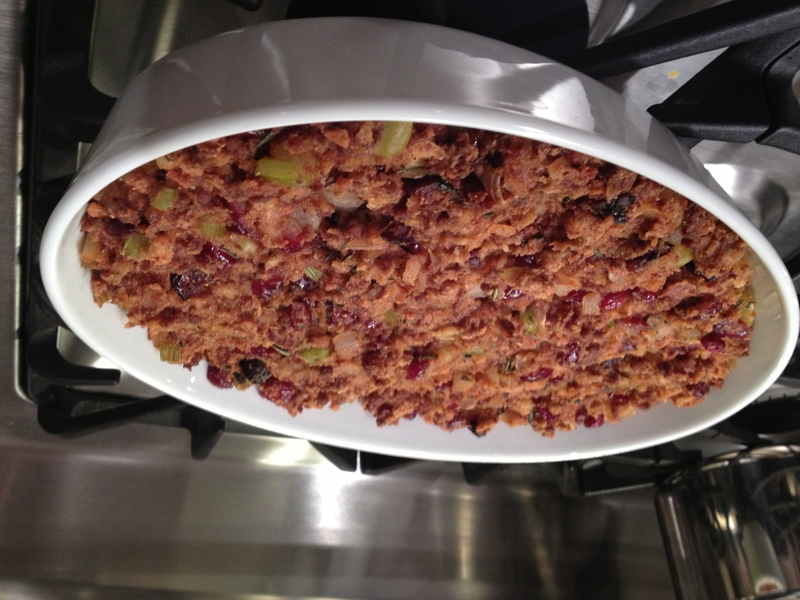 While the recipe is meant to cook as part of a Turkey Breast Roulade (turkey breast wrapped around stuffing), I am opting to cook the stuffing on its own – between the sausage, dried cranberries, dried figs, and celery – just seems like I can’t go wrong. So, little did my mom know when she came over, about a month ago, she’d be spending the day with me to test out the recipe. After all, what research process is complete, with out testing it out before game day?! Roughly two hours spent going to six markets, left us with a deliciously memorable stuffing. My favorite is my mom’s Passover stuffing, so to compare this to hers, wouldn’t make sense – apples to oranges. That said, this is an incredible recipe and fairly easy. Buon apetito! The recipe is that much easier to make, by pre-chopping and measuring all ingredients before cooking. The recipe calls for Calvados (apple brandy) or any brandy, to soak the dried figs and cranberries in. We don’t store hard liquor at home, and my mom had the GENIUS idea to use two mini bar bottles of brandy. At BevMo! this translated to less than $3 for the perfect amount for the recipe. For purposes of our Thanksgiving company, we need the recipe to be Kosher. Luckily, we live close to Jeff’s Gourmet Kosher Sausage Factory (also home to Scott’s favorite burger), and used their veal sausage. This isn’t the “sweet and spicy” mix the recipe suggests, but still turned out great. I omitted Pine Nuts because I don’t like them. Not sure how it would enhance the stuffing since I think they are fairly soft when cooked. For butter, I used Earth Balance non-dairy butter. You can do everything in this recipe the night before, and bake it Thanksgiving morning, in the last 45 minutes of the turkey’s cooking time. This is what my mom made for us in her free time this week (below). She continues to be a source of endless energy, inspiration, creativity, and unconditional love – and for that I am incredibly grateful. 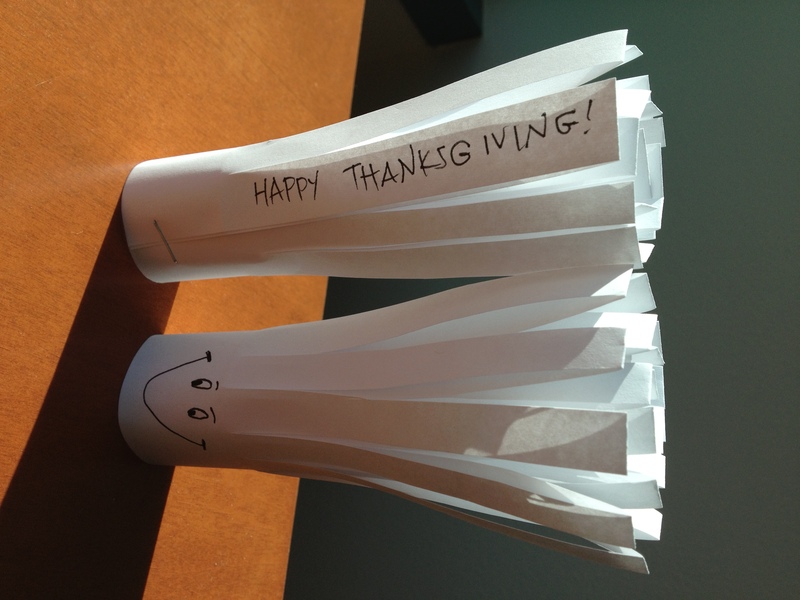 Speaking of which, I am grateful for so many other things this week and can’t help but think of those in the Northeast. I remember vividly the 1994 Northridge earthquake – being in our family friend’s house for two weeks, while we cleaned up the aftermath at our house. It’s not an easy time, and as human nature often proves, we are strong survivors, making the best out of not-so-great situations. If you are able, remember to give what you can the the American Red Cross, to help those in need. For the longest time, the veggie burger at Houston’s has been my favorite burger. It’s sweet, savory and smoky – I actually don’t even eat the bun with it. At home, I’ve tried boca burgers and other frozen brands, but they never compare to the one from Houston’s. When I discovered Gwyneth Paltrow’s recipe for a “homemade veggie burger” – I was incredibly curious to try it. The ingredients were ones I usually stocked in our house, and the steps seemed easy. While it was hard to be patient while the patties cooled in the fridge, the end result was definitely worth it. We’ve enjoyed ours with some of our favorite barbecue sauce (Gayle’s Original) and a whole wheat bun (we like the ones from Whole Foods). I’ve yet to serve this to company, but for a crowd that enjoys veggie burgers and other vegetarian fare – they will certainly love this (it might surprise the meat-lovers too)! The first time I made this, we didn’t have cilantro so I used flat leaf parsley instead. It tasted great. The second time, we used cilantro, and it definitely kicks up the flavor. I would use either – but not omit completely. Sometimes I can’t wait “the couple of hours” to let the patties cool in the fridge. They cook up fine after 20 minutes in the fridge, but definitely hold their shape and have more flavor, the longer they chill out. For brown rice, I’ve used leftover brown rice that was in the refrigerator a few days and the burgers still came out great. I usually just use the 3-minute frozen brown rice from Trader Joes. To cook the burgers, I use just 1 tbsp. safflower oil. For leftovers, you can either leave the patties chilling in the fridge for the next day’s meal and cook then OR I precook them and reheat on a medium-heat skillet the next day. NOTE – if you wanted to make sliders, I think it could make about 8 – just divide the mixture as such – and cook according to recipe. Heat the olive oil in a medium saute pan (with the straight edge) over medium-low heat. Saute the onion, garlic, and cumin together until starting to brown and fragrant, about 7-10 minutes. Add the salt, pepper, beans, and rice and cook, stirring about 2 -4 minutes. Add the cilantro (or parsley) and mash the mixture with a potato masher just to thoroughly combine and get some cohesion – you want the burgers to have some texture. Once the mixture is cooled, I form a rough square of the mixture and divide into four – each section making one patty. 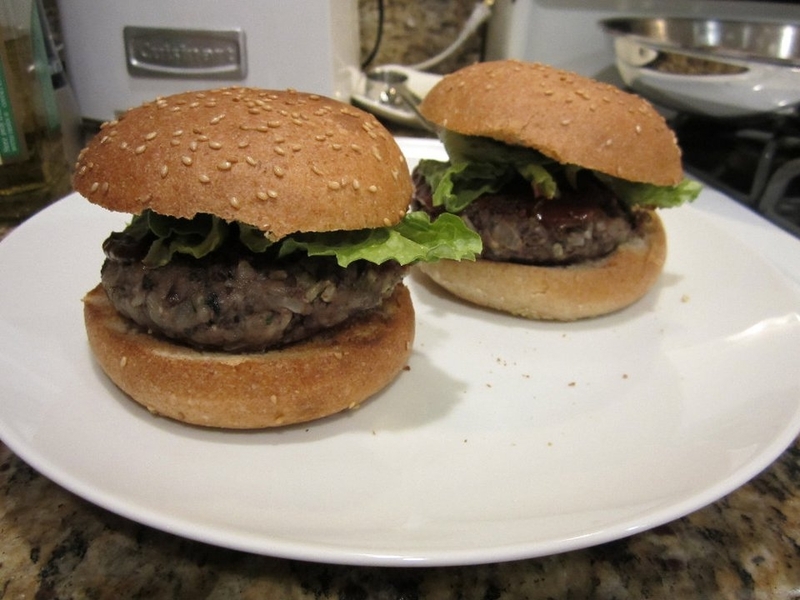 (You can divide smaller if you want to make sliders.) At this point, you can set the burgers in the fridge for a few hours. I put on a plate and cover tightly with saran/plastic wrap. Serve them on buns with all your favorite fixings. P.S. Gwyneth says her vegetarian daughter loves this – so might be a good one for kids too. Look no further for a salad to bring to your 4th of July potluck. 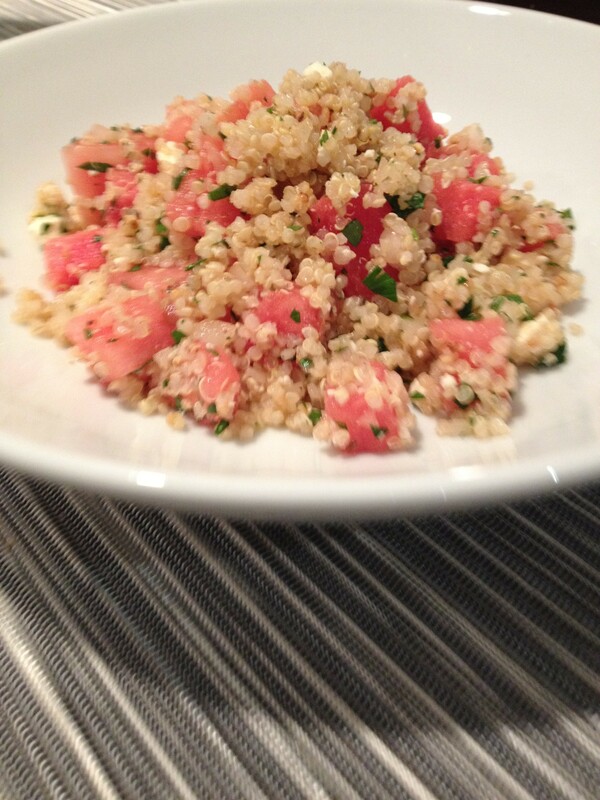 I made Quinoa Salad with Watermelon & Feta this weekend and what a hit! Okay, I admit, my only taster was Scott, but he doesn’t gush about food I make all the time. The apple cider vinegar adds a unique and compelling flavor – making it a definite standout. I trimmed the recipe down for 2 (rather than 8-10) and see no reason why it wouldn’t be as delicious in its full form. I used 1/2 cup uncooked quinoa. To cook: Drain the quinoa. Add quinoa and 1 cup water to a saucepan. Bring that to a boil. Once boiling, reduce heat and cover for 15 minutes to finish cooking. Set aside in a bowl to cool to room temperature. In my family, we don’t kid around about dessert – there are usually just as many options as during the main meal! 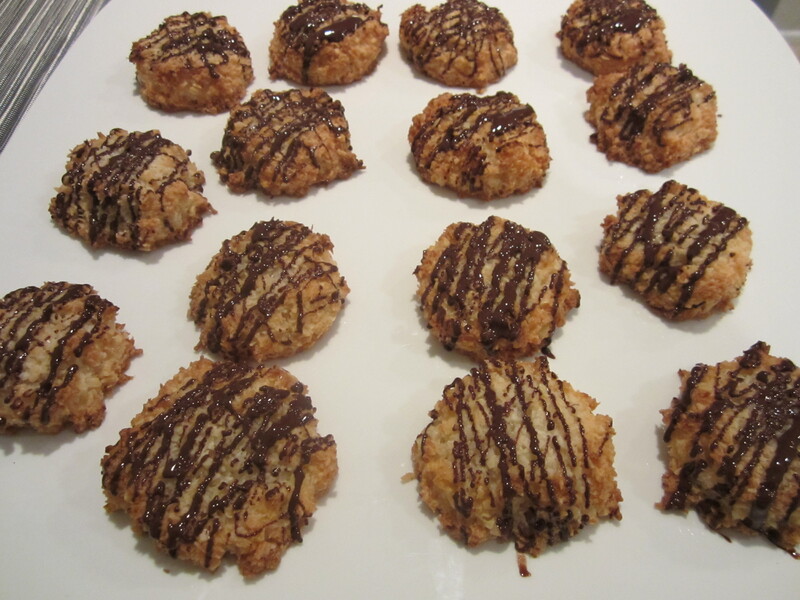 This weekend, I had the pleasure to make macaroons for part of the dessert at our family Seder. I am happy to report that everyone loved them – even the non-coconut fans. Now that we don’t cook meat at home, every night is really Meatless Monday. However, during Passover, this is proving to be more difficult, given our additional, week-long dietary restrictions. Luckily, thanks to quinoa, there seem to be so many more options to enjoy! 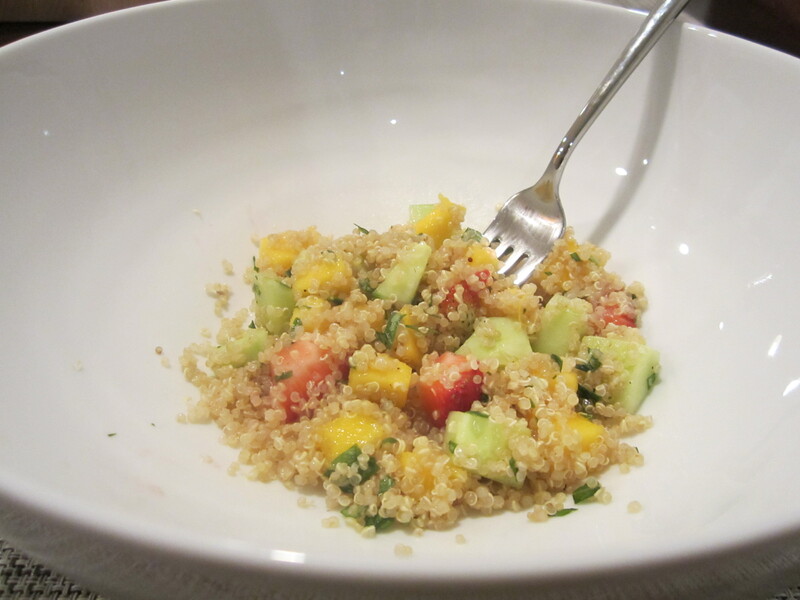 I first saw this Mango Blueberry Quinoa Salad on Pinterest, and with all the colors in the dish – I was intrigued to try. Our blueberries ended up being rotten, so I made a quick switch with strawberries, and the final product was refreshing and filling – definitely a keeper in my recipe file. Thanks, Veggie Belly for a great recipe.